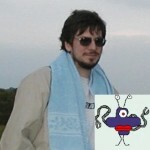 Regular readers of Scide Splitters will be familiar with Alex Shvartsman as editor of the Unidentified Funny Objects humor anthologies, but he has also established a growing reputation as a writer in recent years. Since 2010, Mr. Shvartsman has sold over seventy stories. Explaining Cthulhu to Grandma and Other Stories represents a little over half of this output, presumably the better half. To be honest, when I read my first Shvartsman short story a few years ago, I was not impressed (see my comments on the story You Bet below). So when I was asked to review this collection for Scide Splitters I balked because I prefer to review things that I can recommend to my readers. Never-the-less, I offered to take a look at it before making a decision. In reading the collection, I was delightfully surprised to find Mr. Shvartsman to be a rather talented writer. It is difficult to pin down Shvartsman’s strongest suit as a writer. Nearly half of this collection consists of humorous stories and many of them are fine examples of the art, however, this book also contains well executed tales across a wide range of subgenres under the speculative fiction umbrella. And although they are very much in opposition to humor, I must admit that his most serious stories pack one hell of an emotional punch. A few biographical notes might be in order before I get on to examining the stories themselves. Mr. Shvartsman was born in the Ukraine and immigrated to New York in his teens, so it should not be a surprise to see these settings pop up with some frequency in his stories. Additionally, gamers might be interested to know that Mr. Shvartsman once made a living as a professional Magic: The Gathering player, traveling the world to complete in tournaments and winning over $100,000 in the process. He is also the proprietor of Kings Games, a game shop in Brooklyn. Explaining Cthulhu to Grandma and Other Stories contains a total of forty stories, each with an afterward by the author explaining the origin and publication history of the story (Ken Liu provides the overall collection introduction). Since that is quite a few to review individually, and since not all of them are humor, I will limit my brief story descriptions to the humorous ones and the most noteworthy non-humorous ones. And as always, I will try to avoid spoilers. “Explaining Cthulhu to Grandma” – A young woman from a family with a magic pawn shop acquires Cthulhu trapped in a pocket universe (think snow globe). Her grandma, unfamiliar with the Lovecraftian deity, is not impressed until several factions arrive hoping to acquire the god for humorously ill-advised purposes. This story won the 2014 WSFA Small Press Award for Short Fiction. “The Rumination on What Isn’t” – A great example of what can be done with flash fiction. To avoid spoiling it, I will only state that it is science fiction, not in any way funny, but has potent impact. “Doubt” – An assassin with cybernetic implants faces doubt as he tries to stay ahead of the competition. A techno-thriller with interesting internal character conflict. Another non-humor story, but don’t skip it. “The Epistolary History” – A short, clever, humorous series of letters from a man to his wife just after he has invented a time machine. “A Shard Glows in Brooklyn” – Amusing urban fantasy in which members of the Watch protect normal people from the paranormal that they can’t see. Conrad Brent is testing out a new recruit to see if he can handle the weird stuff. “Requiem For a Druid” – Conrad Brent of the Watch returns to solve the mystery of who is using magic to obstruct a big development project. “Bedtime Story on Christmas Eve, 1,000,000 AD” – Flash humor, the story of Christmas distorted by a million years and some other things. “Seven Conversations in Locked Rooms” – In a future in which memory modification is used to treat criminals rather than incarcerate them, a man chooses to serve time instead. Shvartsman’s interesting treatment makes this another non-humor piece not to miss. “The Field Trip” – Five students vie for an internship with a renowned xenoarchaeologist. An early Shvartsman story attempted in a Douglas Adams style, but he doesn’t quite pull it off. “Superior Firepower” – Angels arrive in Israel for Armageddon and find UN peacekeepers blocking their way. Another early humor story, but this one works really well. Laugh out loud funny. 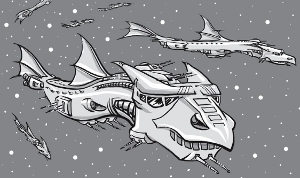 “The Dragon Ships of Tycho” – Solid space opera in which Earth diplomats desperately try to form an alliance to defend against a hive species called the Swarm. “The Tell-Tale Ear” – The unscrupulous CEO of a marketing company is hearing the ads they are forcing on people in public places, as told through a series of emails. Humorous use of the Poe story. “The Miracle on Tau Prime” – Representatives of the Vatican investigate a reported miracle on another planet. “The Tinker Bell Problem” – Shvartsman comically turns the idea of summoning a demon with a pentagram upside down as a man finds himself summoned by demons. “True Love” – A woman is disappointed when she tries to experience true love through the services of Temporal Excursions, Inc., a company that allows people to experience the lives of people in the past. “You Bet” – A man who can’t remember who he is finds himself playing poker in a room full of pop-culture tropes. The slow reveal didn’t keep my interest and the pop-culture jokes seemed flat. “Worldbuilding” – A writer is called to his editor’s office to discuss problems in the worldbuilding of his space fantasy. 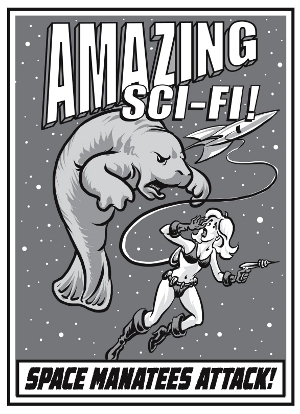 Hilarious conversation as they discuss the plausibility of carnivorous space manatees. One of my favorites in the collection. “Icarus Falls” – An old woman is losing her memory, but even on her worst days remembers her daughter who visits her daily. Reporters camp outside the hospital to cover her story, but the woman doesn’t know why. This is an excellent character driven science fiction tale that I’d rather not spoil with any more detail. Another non-humor piece that demonstrates Shvartsman’s range. “A One-Sided Argument” – After an alien crashes in Manhattan killing thousands, a man argues with his wife who tells him it was an accident. He thinks it was intentional. Well done non-humorous flash fiction inspired by 9-11. “How Earth Narrowly Escaped an Invasion from Space” – An Invasion fleet of cats comes to conquer earth. Silly, cute, has cat puns, but it works. “Fate and Other Variables” – A kabbalist enlists an atheist computer hacker to hack the book of fate updated annually by angels. Interesting concept inspired by the fact that Hebrew letters are also numbers. Overall, Explaining Cthulhu to Grandma and Other Stories is an impressive collection with plenty to offer the humor enthusiast while showcasing Alex Shvartsman’s command of storytelling in a wide range of speculative fiction subgenres. Mr. Shvartsman is one to watch. Explaining Cthulhu to Grandma and Other Stories is available from UFO Publishing. 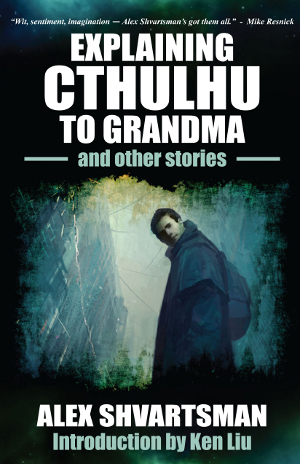 2 thoughts on "Scide Splitters: Explaining Cthulhu to Grandma and Other Stories by Alex Shvartsman"
Thank you, David, for another top notch review. But, truth be told, the collection’s title had me sold. At 40 stories that is quite an output and the consideration of the writer to add an afterward always interests me. Guess that comes from reading Ellison. Excuse the brevity of this note, keeping the screen in focus on my phone makes it a chore. Thank you, John. Your comments are always appreciated. Even your briefest observations tend to add something interesting to the discussion. I agree that when an author adds something, be it an afterward or forward, it gives me just that little added interest in getting the book. In some ways, a story can almost seem naked without one.